Our range of products include Poultry Chicken Portioning Machine such as Meat Cutter, Cutting Machine for Chicken, Chicken Cutting Machine, Chicken Slaughter Machine, Chicken and Duck Cutting Machine, Poultry Meat Cutter and many more items. We are well known enterprise engaged in manufacturing and supplying highly viable Meat Cutter. 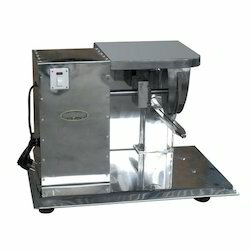 This machine is equipped with 8 inch steel blade and powerful sheers to efficiently chop and slice the meat. Widely used in hotels and restaurants, this equipment features heavy duty design manufactured by using finest grade stainless steel. We are well known enterprise engaged in manufacturing and supplying highly viable Cutting Machine for Chicken. This leading quality machine operates on a power saving motor and steel blades to make the task of chopping chicken pieces faster and easier. Our prestigious clients can avail this high performing machine from us for equal sized dicing and slicing of product at best market price. Our technological adeptness has made us the pioneers of manufacturing and supplying highly durable Chicken Cutting Machine. Ideally suitable for chicken shops and commercial kitchens, this powerful equipment chops chicken pieces into equal sized slices and strips. Developed from stainless steel sheet, this machine is backed with 0.5hp motor that comes with assurance of longevity. We have established ourselves as trustful manufacturers and suppliers of highly durable Chicken Slaughter Machine. High in demand by industrial and commercial kitchens, this machine performs the slaughtering operation by electric numbing and killing. Developed from premium grade stainless steel sheet our prestigious clients can avail this high performing machine from us. We are among the reputed companies to manufacture and supply Chicken And Duck Cutting Machine, which is provided in tamper proof packaging. Sturdily constructed & functionally fluent, this chicken and duck cutting machine is highly demanded in hotels, restaurants and various food processing industries. To meet diverse client demands, we provide the selection in multiple specifications. 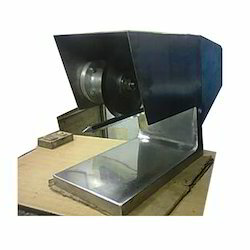 Being an eminent manufacturer and supplier, our company brings forth Poultry Meat Cutter. To meet diverse client demands, we proffer the range in different specifications. The cutter machines are highly demanded for cutting meat, bef and chicken into slices, strips, traces or cubes. Poultry meat-cutter machines are acclaimed for their excellent performance and easy operation. Chicken Cutting Machine Offered by us is a world-class range of chicken cutting machines that finds wide application in hotels and restaurants. These machines are instrumental in cutting meat, and chicken into slices, traces, cubes or strips. Offered by us is a world-class range of chicken cutting machines that finds wide application in hotels and restaurants. These machines are instrumental in cutting meat, beef and chicken into slices, traces, cubes or strips. Easy to install and operate, these machines have a high demand in the domestic as well as international markets. Our clients can avail these hi-tech machines from us at industry leading prices. With our sound knowledge in this industry we are offering our clients, a wide range of Chicken Cutting Machines that is widely used in hotels and restaurants. Our range has the capability of cutting meat, beef and chicken into slices, traces, cubes or strips. In addition to this, our range has gained appreciation from the clients due to its longer functional life, corrosion resistance and easy installation features. Owing to the years of industrial experience, we have been able to serve our valued clients with a wide range of Chicken Cutting Machines. 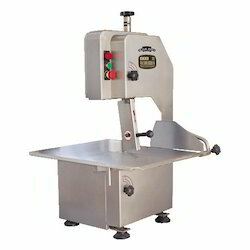 Offered by us is a world-class range of chicken cutting machines that finds wide application in hotels and restaurants. 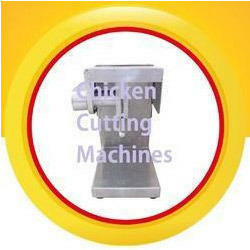 We are offering our clients, a wide range of Chicken Cutting Machines that is widely used in hotels and restaurants. Our range has the capability of cutting meat, and chicken into slices, traces, cubes or strips. In addition to this, our range has gained appreciation from the clients due to its longer functional life, corrosion resistance and easy installation features. We are offering poultry chicken cutting machine which is of high quality with excellent finish having the blades which cut chicken into various size pieces in a very fast and efficient way. We are offering our clients, a wide range of Chicken Cutting Machine that is widely used in hotels and restaurants. Our range has the capability of cutting meat, and chicken. In addition to this, our range has gained appreciation from the clients due to its longer functional life. It is made of high quality stainless raw materials. Leveraging on wide expertise, we are instrumental in manufacturing, supplying, and tradingChicken Cutting Machine. Our offered machine features innovative chopping mechanism that is widely demanded for commercial use. This machine is equipped with 8 inch blade and shears and efficiently cuts chicken pieces into slices, strips, cubes and traces of 0.7 mm to 60 mm in size. With the help of our efficient workforce, we are able to provide our clients with a comprehensive range of Chicken Cutting Machines that designed in accordance with international quality standards and norms, which is widely used in hotels, restaurants and poultry.